Download The Accumetrix Mortgage App! NOTE: When you download our app, please ensure you select “Jonathan Chan” when promoted on the screen options to “Find a Broker”. For many people, their home, and its contents are their most treasured possessions. 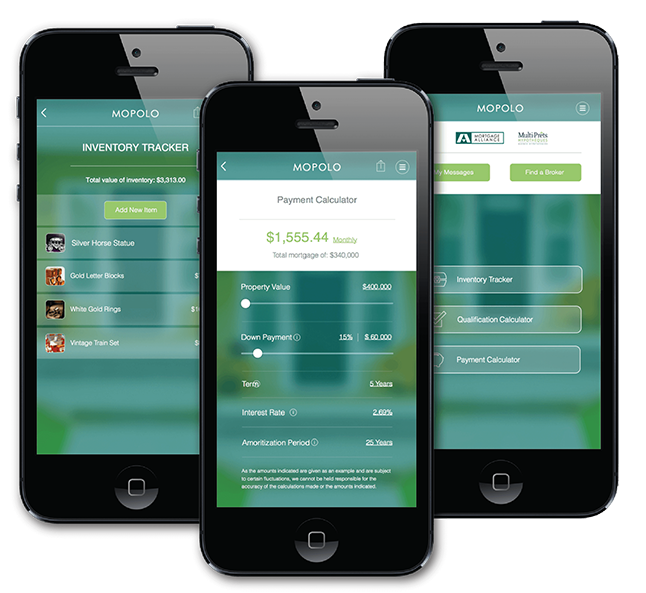 MOPOLO lets you keep them at your fingertips with its exclusive INVENTORY TRACKER. Keeping track of your personal inventory has never been easier. Take photos of your belongings, enter a description including the value of the item, and upload the receipt. You will be able to see a running total of your contents and can email the details with 1 click to store as back-up or send to your insurance provider in case of emergency. The CREDIT APPLICATIONS feature lets you apply for a mortgage or personal loan right from your smart phone. Our lives move so quick it only makes sense you can apply for credit whenever and from where ever by answering a few simple questions. Once submitted your Mortgage Alliance Professional will follow-up with you by phone or email – which ever you choose. MOPOLO’s messaging system can help save thousands of dollars in unnecessary interest by keeping you informed about the real estate and finance industry so you can make the right moves. MOPOLO even comes equipped with easy to use calculators that help you determine monthly carrying costs and how much home you may actually be able to buy.